At times of stress, as human beings, we have a natural tendency to mother ourselves and reach out for something to relieve the pressure. Maybe we have a major worry and although we try to keep the positive side out, there are times when we cannot avoid the negative thorns of the problem. Maybe we are just having a bad day, and metaphorically, everything we touch seems to fall and every traffic light is red. Some days you think you’d be better off to go back to bed, draw a line and start again. We tend to have our own personal ways to relieve the stresses of life. Be it a cup of tea, a phone call to a friend, a cigarette or even a drink! There is however, another proven way to relieve stress and anxiety that has been proven as restorative to the extent of being recognized as a profession. Music Therapy is actually an established health profession where a qualified music therapist uses music to assess and treat psychological and physical conditions. It has been proven to be particularly helpful for people who find it difficult to express themselves in words. Research has shown that music therapy is effective for the treatment of many patients including the ability to successfully trigger motivation, movement and positive emotional support. There is a Dutch violinist/conductor, who naturally possesses these qualifications through his expression of music. Fans of Andre Rieu have their stress-ammunition at the ready, in the form of CDs, DVDs, recorded TV concerts or other media. No matter what way we listen or watch, the sound of Andre’s voice, violin and orchestra playing has an immediate effect on the listener. For me, it brings me to another world. If I turn it on particularly to relieve stress, I immediately tune into a more positive mood. It motivates me to put one foot in front of the other and get on with it (in three four time of course!) In regards to the sound of the Maestro’s voice, I’d like to add that it doesn’t matter whether he speaks in Dutch or English; his voice in any language is therapeutic to my ears! (Plus I am definitely pickin’ up a few good Dutch phrases: fantashtich! … will get to the spellings some time…hehe) Can’t fail to mention his pleasing appearance here too; I can only speak for the ladies but his looks, charm and charisma are efficacious! 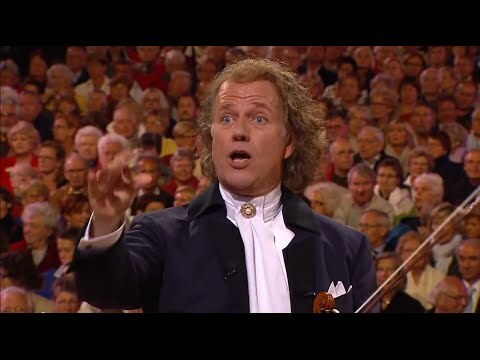 Andre Rieu made a decision to express music in this way to his audiences. His father was a conductor and at a young age, Andre was disturbed by the grave formality of orchestral classical performances. He was troubled by the conventional means of expressing classical music not only for those performing, but also for the audience. Not only does Andre Rieu bring joy to listeners, but he also keeps classical music alive and brings it to the ears of those who may never have realized their appreciation for it without his contribution. 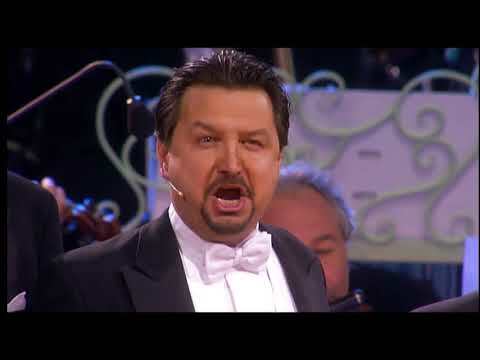 His ability to fuse a range of songs and pieces into each concert program in a perfectly formed sequence makes the entire show engaging to the audience and viewers. Ranging from Michael Jackson and Abba songs to Beehoven and Mozart pieces, Andre captures our attention from start to finish. 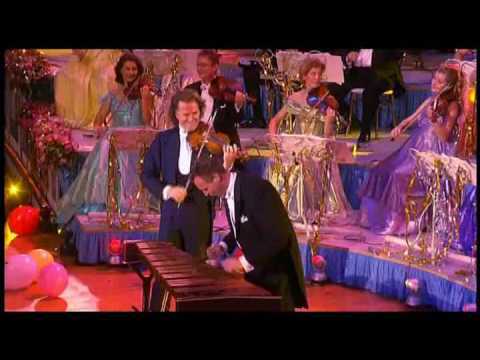 He specializes in Johann Strauss, playing beautiful waltzes and pieces with his aptly-named Johann Strauss Orchestra. The female members of his orchestra are dressed in delightful colourful gowns and the soloists appear in cheerful appropriate costume for each piece. He makes us laugh, cry, dance and sing (sometimes in Dutch too!) all in one session. What therapy can achieve all that in such a short time? This entry was posted in Blog on March 22, 2014 by Megill. Experience Andre Rieu in Maastricht, 2014 at a cinema near you. 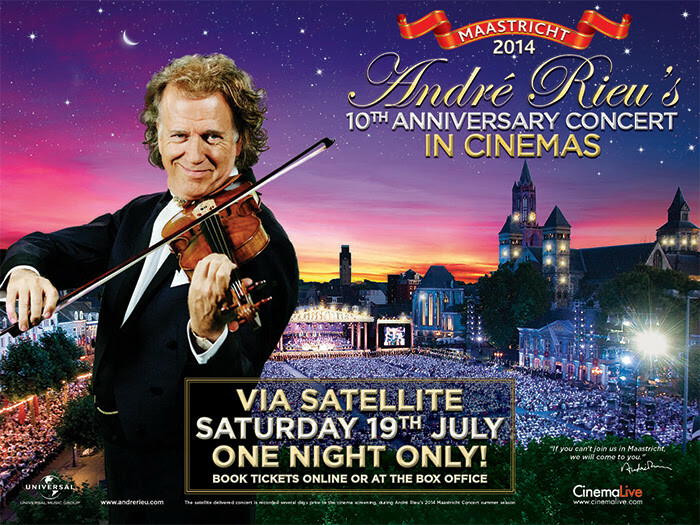 CinemaLive have announced that André Rieu’s 10th Anniversary 2014 Maastricht Concert will be delivered to cinemas via satellite, across the UK, Ireland and Europe on Saturday 19th July and Australia and New Zealand on 26th & 27th July. Saturday 19th July – FOR ONE NIGHT ONLY! This entry was posted in Blog on March 13, 2014 by Megill. I couldn’t resist asking Maggie’s permission to post this little story on The Sound of Maastricht… her group of Andre Rieu fan friends on Facebook found it very entertaining…. Unfortunately for the gremlins, Maggie wasn’t impressed and returned the mug. She said “The other person wrote in and also complained that they had the wrong mug”…… Let’s imagine the other person’s surprise receiving a mug of our Andre after ordering a Gremlin mug. Although Maggie said “if i get the right one this time i won’t be doing an impression of Andre. The gremlin was easy. Hahaha…”, I think her expression with the Andre mug is perfectly apt – happiness! Maggie is going to Maastricht this year to see our hero. Safe trip to the Maastricht gang in 2014! This entry was posted in Blog on February 27, 2014 by Megill. He has a special gift to warm the hearts of fans worldwide not only through his music, but also through his charm and charisma. Justin Beiber fans (Beliebers) claim they have Bieber fever. For Andre fans, there is certainly a case for christening his impassioned fans with a fitting label. In another article on this site I stated I had Andre-itis, but I’m sure we could come up with a more tuneful tag. One fan, in Australia has taken her devotion to the masses, with a video plea to Andre to let her sing with him. Desiree Regina from Sydney, made a video proclaiming her admiration to Andre to the tune of Habanera from Carmen. In the video “Ode to Andre Rieu”, she makes her plea to perform with him, as she shows herself in quirky scenes from her home village of Bundeena, Sydney. This entry was posted in Blog on February 16, 2014 by Megill.